The unique and natural makeup creations that appear in most of the photos on the web pages of the ISOMA Cosmetic website were designed and created by Joyce Kang, the International Artistic Director of ISOMA. The International Society of Makeup Artists, which is also referred to as ISOMA, is pleased to present you with its limited edition cosmetic line called ISOMA COSMETICS. 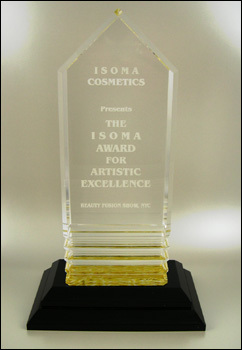 ISOMA COSMETICS is the professional line of premium quality cosmetics for multi-media makeup artists who are employed in the film, television, video, theater and photography industry. They were especially created by a variety of international multi-media makeup artists for their personal use and are now available internationally. 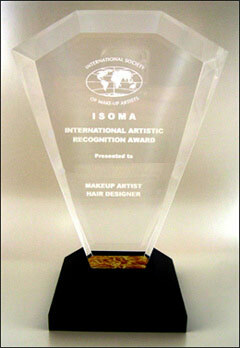 ISOMA COSMETICS is the choice of foundation that is used internationally by many of today's multi-media makeup artists. It has distinctive properties and pleasing compatibility with the extremely fine color emulsions of film stock, high quality videotape, high-end demands of standard definition and high definition television and diverse spectrum of lighting, making it most useful in the multi-media makeup profession. ISOMA COSMETICS consists of a variety of simplified shade selections for any media. They offer sheer, medium and extra coverage options, and are long-lasting shades for a variety of international skin-tones. ISOMA COSMETICS is the trusted name in makeup that many professionals rely on for premium quality cosmetics to create their beautifying and character artistry. 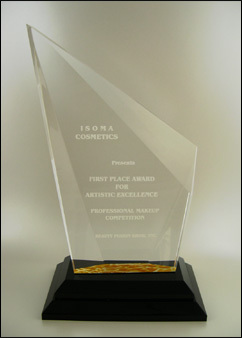 A few of the various awards that are presented by ISOMA COSMETICS internationally.